If you delight in the exploration of knowledge; if you enjoy finding the connections among academic disciplines; if you respond to challenge and revel in serious reflection about ideas; if you want to discover how to use your gifts in vital service to others, we encourage you to explore the opportunities offered through Huntingdon’s Joyce and Truman Hobbs Honors Program. 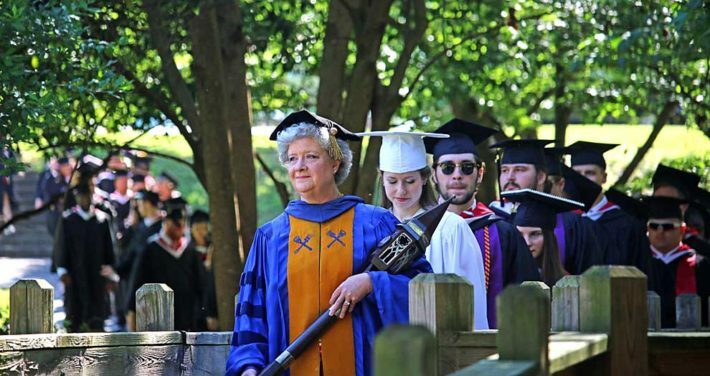 Named for two of Montgomery’s most distinguished citizens, the late Judge Truman Hobbs and Mrs. Joyce Hobbs, Huntingdon’s unique honors curriculum asks students not only to seek high personal academic achievement, but also to ask how such achievement might serve the world in which they live. The Joyce and Truman Hobbs Honors Program at Huntingdon College encourages students to embrace the social nature of knowledge through enriched classroom experiences and challenging civic service. Asked to commit to the high ideals of “faith, wisdom, and service,” Honors students will better understand their responsibility to humankind in Montgomery and around the world. Students whose applications demonstrate a clear and strong record of academic success will be invited to join the program. If you have any questions or concerns, please contact one of the directors of the Honors Program, Dr. Stephen Sours (stephen.sours@hawks.huntingdon.edu) or Dr. Sarah Sours (sarah.sours@hawks.huntingdon.edu). Complete 18 hours (six courses) of Honors-designated courses, of which 3 hours (one course) must be in math or science. All Honors-designated courses also satisfy Core Curriculum requirements. Complete a second major, a minor, or 12 hours of 300- or 400-level courses outside your major. Attend at least 3 Honors events per year. Complete 40 hours of community service—on your own, with another campus group, or with Honors service events. Achieve a 3.5 cumulative final GPA, and a 3.0 GPA in Honors courses. You will be kept apprised of your progress toward completion of the Honors Program through online records. A more detailed explanation of these requirements is available in the Huntingdon College Catalog and on the Honors Program page on the Huntingdon website. As an Honors student, you will be a part of special learning community. Your fellow Honors students will encourage, challenge, and support you; your Honors professors will inspire and engage you; special Honors events will refresh you; and your Honors program directors—Dr. Sarah Sours and Dr. Stephen Sours—will cheer you and encourage you along the way. At graduation (and on your diploma and transcript), your work will be recognized with an Honors designation on your degree. Interested students should contact the Honors Program directors, Dr. Sarah Conrad Sours and Dr. Stephen Sours.